Organize my space at home – my office desk, closets, etc. I am ready and excited for the webinar (you still have time to sign up! ), and have already written 3 chapters on my ebook (my deadline for the new ebook is February 29). After I took down our Christmas tree and decorations, I cleaned out drawers and closets, organized my file organizer, and went through all my sticky notes on my desk, taming that paper tiger. Or you might not have even heard of it. What is 3 in 30? It’s a joint venture between Ashley Pichea (AP Freewriting 101) and Meghan Tucker (The Tuckers Take Tennessee) to encourage and challenge you to accomplish your goals. By breaking up our to-do lists into more doable, bite-sized chunks and checking in with each other over the course of a month, we can accomplish our goals together. It really helps when girlfriends are encouraging you that you can do it! Sometimes we struggle with procrastination, distractions like the Facebook black hole, or just overwhelm. It’s like you need someone spurring you! Have a GREAT webinar that brings a smile to God’s face, and that equips and empowers the women attending!!! Start the new zumba class (our oldest daughter Heather is teaching it again, and is starting a second class in a different city), doing zumba at home in between class, at least 2-3 times week with my tapes. Arrg – pray for my self-discipline! God has great things for you to do in 2011. He wants us to intentionally plan and set high goals, not just float along with a c’est sera sera attitude. As we go to Him in prayer and ask Him what He wants us to accomplish this year, He will show us and help us. And He will shine His glory through His Son Jesus in it, using you as the willing vessel! So what are your goals for February? Write them down! I’d love to hear about them in the comments below. Ashley, I’m so excited to be a part of this with yall! Thanks for the encouragement! We can do it with God’s help! 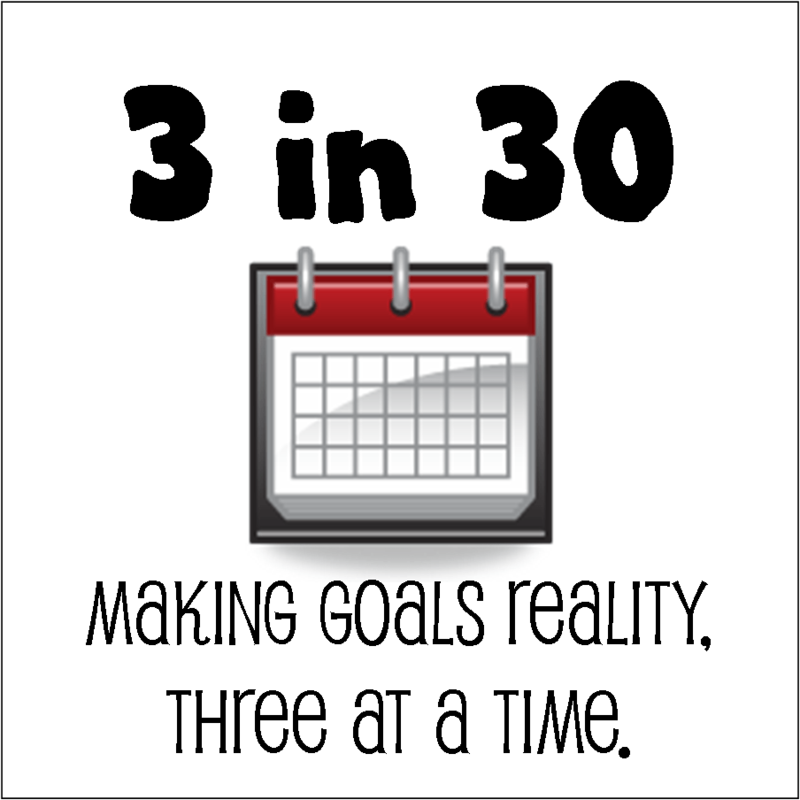 We are SO glad that you are joining with us in the #3in30 Challenge!! Great goals for February – let’s make them reality together! !